Luxury 80 page notebook complete with lined pages, a book mark ribbon and an elastic closure band featuring a unique logo strip. An attractive notebook, that is available in a great range of colours - can be printed in full colour to give your brand that extra edge over your competitors! Finally a notebook and that you can print in beautiful full colour! Gradient/shaded colours are all possible on this great product. Top selling notebook with a hard wearing plastic cover that comes with a matching mini pen. High quality A5 Notebook with a large print area. Available in 6 great colours, this product will contrast your logo very well. Perfect bound note pad in three handy sizes with 60 lined pages and a cardboard cover. The internet is taking over, computers are ruling our lives! - well that may be true for some journalists in ivory towers who spend all of their days thinking of how to stretch the truth and shape our perceptions. However in this 'paper-less' age some things are as popular as ever - calendars, post it notes, A4 paper, desk pads, notepads and Promotional Notebooks. There is no escaping the fact that many of us like to take note of important things on paper - the computer just does not do the trick when we want to scribble something down quickly - the humble Notebook is going nowhere fast. We have a range of Notebooks varying in size and price that are suitable to promote your brand and message in many different ways.There are many, many different options available when you want to purchase a notebook. it is tempting to immediately start scouting around a product gallery and find ones that you like the look of however may we suggest a slightly different approach? Grab a piece of paper (yes that stuff that us ordinary folk don't use anymore) and ask some questions. Why am I buying these? - who are they going to be used by? and for what purpose? Are you looking for a pocket sized notebook for tradies or are you looking a higher quality, larger desk notepad? or perhaps (and becoming increasingly popular) maybe you want to use an upmarket leather-bound pad as a gift emblazoned with your corporate logo or message as a corporate gift? Once these questions are answered is the time to consider your budget - we are here to help guide you of course so please pick up the phone and call us anytime - we are here to assist you in selecting the right product for you. 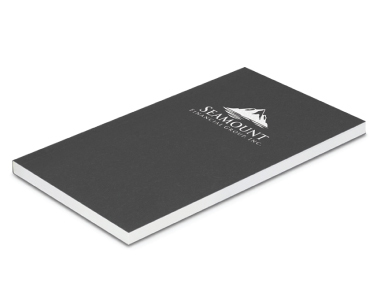 Once our sales team have helped you select a great Custom Promotional Notebook we can set about transforming it from a blank canvas into a unique Promotional Item that will have great marketing appeal and success. We have all seen poor design and good design however it can be hard to put our finger on why, exactly, one design works and the other does not. The difference is easy - one has been slapped together the other has been given a design brief and the put together by a trained professional with years of experience. Remember that a well designed note book costs no more than one with poorly considered and executed artwork - the difference is a small investment in design - an investment worth making when you are serious about marketing! Hopefully when you deal with us our focus on quality, service and design will become apparent, there is one other thing worthy of a mention though - we are seriously focused on price also - if you find a lower price please let us know about it - we will bend over backwards to help you get our good stuff at a lower cost if we can! We measure our success in retaining clients - only when you come back for more quality products are we truly happy - our brand, message, and marketing efforts will always be on the mark when you team up with BrandMe.com.au: expect more.